A sidescrolling roguelite with optional realtime (off-tile movement). Has a static menu with actions and inventory management (a la Skyrim.) Download the game here (note that the latest version, 1.0.8, is only available on itch.io). You are Red, the widow of the hero from the original game of Rogue. Your dead husband has freed himself from the Underworld and has lead you to the Chaos Dungeon to restore him from his undead status. Find the Balrog who killed him and take back the amulet of Yendor - it is your only hope of restoring your husband back to life. 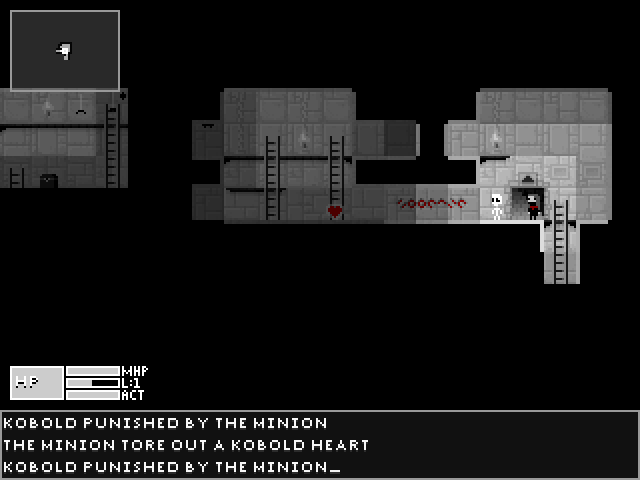 Red Rogue is an attempt at combining Rogue and the platformer game genre. Its design philosophy is to be playable with only 5 keys (more through customisable key bindings) and have simple gameplay, yet have the complexity of a standard roguelike that is revealed only through constant experimentation with the elements in the game (like NetHack). The game has 20 races, 20 weapons, 20 armour and 20 spells across 4 zones and two unique areas: The Overworld and the Underworld. It also has other features such as sliding walls, traps, kicking decapitated heads at foes, secret areas, Death, the Grindstone and more. I can be reached at me@robotacid.com -- feedback and bug reports are welcome. Move with the arrow keys or w,a,s,d. There is no jump. Attacks are performed in the manner of Rogue, by walking into monsters. Landing on the head of a character stuns them. Press up to pick up items and read the writing on the wall. Press down to exit a level when in front of a stairway or portal. Press space to enter the menu. From there you can equip items, cast spells, perform actions (like sleep or search for traps and secrets) and customise your gameplay. Spells in the game are cast with rune items. Runes can be cast on the player, her minion, monsters and equipment. Some are beneficial, some are deadly, some do very different things depending on what you cast them on. Menu actions can be bound to keys. Preset hotkeys are currently: Z - search, X - disarm trap, C - summon minion to your location, F - shoot missile weapon / throw offhand weapon. Check the actions list in the menu for a reminder. Find good items and enchant them. The game will, however, allow you to enchant items with unpleasant powers - eg: enchanting armour with teleport will result in it teleporting out of your inventory, and if you find it and wear it, you will have teleportitis. Some spells do very different things depending on what they are cast on. Portal runes, for example, are very versatile. Try to keep the minion alive. Crush the heads of monsters you decapitate - you may create a "face" item. Wearing the face of a monster temporarily polymorphs you into that monster, giving you new special abilities like finding extra treasure, or item stealing. Some items have special abilities, such as the unnamed item which renders one invisible, or the wizard hat that doubles each new type of enchantment applied to it.